The vast majority of patients want tooth coloured fillings when a filling is indicated. These fillings look much more natural and require less removal of tooth structure when compared to the older amalgam, or silver, fillings. These fillings have been used with great success at Fenton Dental since 1981 in both back and front teeth. 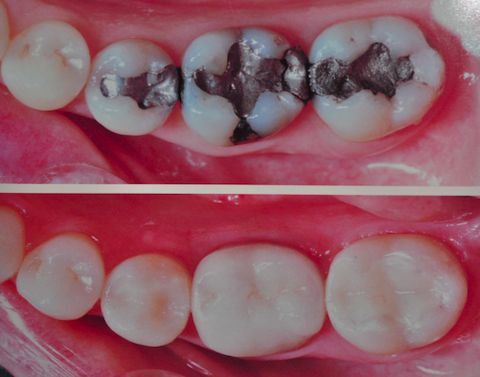 Today we can use tooth coloured fillings to replace failing amalgam fillings, repair damaged teeth and fill new cavities. Completing these fillings early may mean preventing the need for crowns, root canal treatments or extractions later. This material can also be used to improve the appearance of teeth by closing gaps or changing the colour or shape of teeth. It is important to recognise that the material does have some limitations and in some instances a porcelain crown or veneer may be required for a better looking and longer lasting result. Fenton Dental is the longest established practice in Mooloolaba and was established in 1981 by Dr Mike Fenton.